Although December 31 and January 1 are also public holidays, Chinese New Year in Macau is the city’s biggest and boldest annual celebration. Families swap gifts, share wishes for the new year, and eat too much — think Christmas but with firecrackers, lion and dragon dances, and lots of noise. The 2019 Chinese New Year celebration in Macau begins on Tuesday, February 5 (dates change from year to year). Public holidays in Macau run from February 4 – 7, although the holiday itself goes for 15 days. The Lunar New Year holiday isn't just big in China, it's the most widely celebrated holiday in the world! The festivities across the water are equally impressive as people celebrate Chinese New Year in Hong Kong. Temples in Macau are very crowded on Chinese New Year as locals ply their favorite deities with goodies and gifts in the hope of buying some good luck in the new year. Amidst the crowds and haze of incense, you’ll find dragon dances and drumming groups as well as fortune tellers promising to give you a glimpse into the future and explain your horoscope. The liveliest temple for Chinese New Year in Macau is the A-Ma Temple. It was constructed in 1488 and is thought to be where the settlement gets its name. The most lively time to visit the A-Ma Temple is traditionally Chinese New Year’s Eve — in 2019, that will be on February 4. Macau’s flagship event is its annual Chinese New Year parade. This festival of floats, dancers, and drummers will feature scores of lion dances, a variety of local and regional floats, and the blockbuster attraction: a dragon dance that may be the longest in the world. The parade will sway its way from Senado Square past numerous UNESCO World Heritage structures and colonial Portuguese buildings through to the ruins of St Paul. It wouldn’t be a Chinese festival without blowing up some fireworks, in the sky and on the street. Macau goes big for Chinese New Year and tends to let off a whole factory's worth! The show promises to be truly spectacular. The best vantage point for watching the fireworks will be from the base of the Macau Tower or facing back across the water from the waterfront on Taipa. You should be able to see the display all along the waterfront. Flowers are an integral part of celebrating; people give and decorate with fresh flowers as one of the many traditions observed during Chinese New Year. The run up to the big day is intense. Flower markets spring up and stay open late to satisfy the demand for kumquat trees and other good-luck flowers. These markets are best visited at night after 8 p.m. when they are packed with families hunting down their favorite tree and arms loaded with flowers. The atmosphere in Macau's flower markets is social and celebratory, and you’ll find plenty of sweet food and drinks to enjoy. Macau has two primary locations: one at Fisherman’s Wharf and the other at Tap Seac Square — the latter is by far the better option. Macau’s casinos are promising a bonanza of promotions and deals for Chinese New Year, although it’s worth mentioning that most of them are designed to part you and your money by way of betting incentives. Beyond gambling, the MGM Grand has thrown together a 22-meter-high tech dragon to greet visitors while the Grand Lisboa will be offering prize draws and giveaways. The Venetian Macau is running Chinese New Year meal promotions. 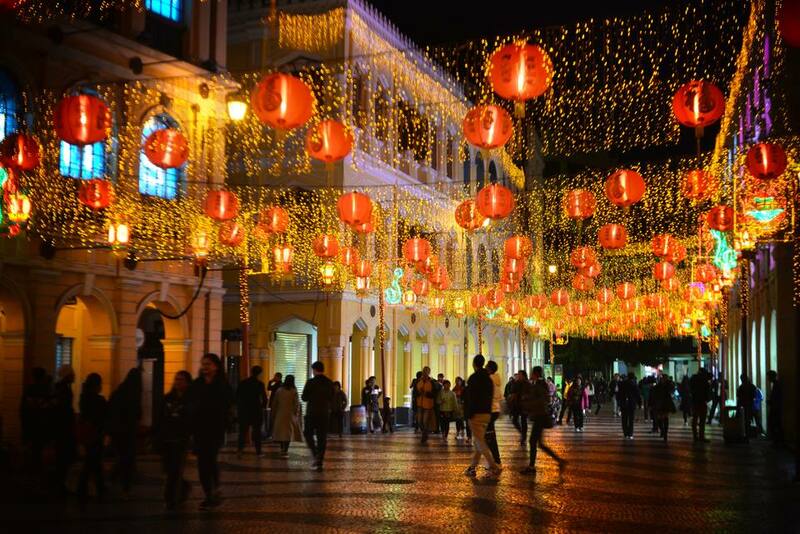 As you can already guess, Chinese New Year is an extremely busy time to travel in Macau. Plan accordingly by booking your accommodation in Macau as far in advance as possible. Expect larger crowds and longer waits than usual. Although many businesses will be closed for the holiday, the places that provide services to tourists will still be open. You'll still be able to find places to eat; casinos won't be the only option. The busiest travel times will be just before the Chinese New Year holiday begins and just after as the largest human migration on earth takes place!